This conversation between a kid and an ant helps us to look at things from another point of view, and to see the “humanity” in another being. Phil and Hannah are a father and daughter. 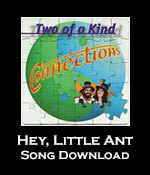 You may be familiar with the wonderful picture book that has been made from this song.